I’ve seen superheroes fight a lot of things, but Gatchaman Crowds Insight takes them out of their element—instead of superheroes battling blatant villains, we see how they deal with sweeping social changes. 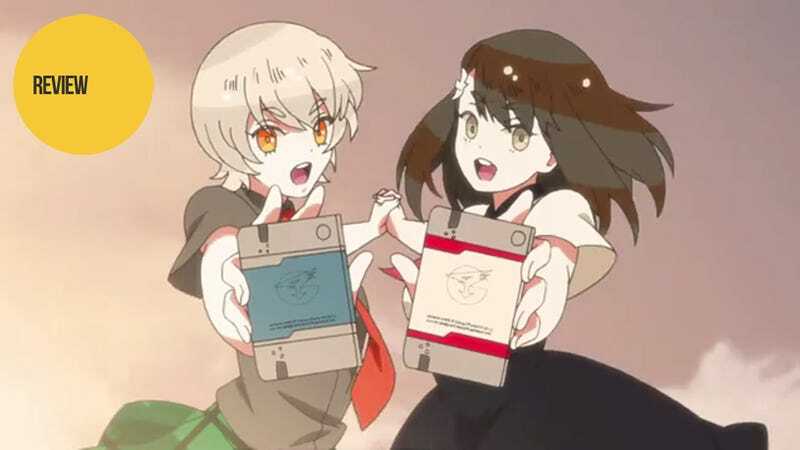 The first season of Gatchaman Crowds deals largely with two major social changes in Japan that set the stage for what happens in the second season, Insight. We see the popular app Galax introduced, which turns being a good person into a game. Then comes the “Crowds” special gift—a feature of the app that allows the players with the best “good person score” to leave their bodies temporarily and become superhumanly strong creatures of pure willpower. While Rui, the creator of Galax, hopes to use the app and the Crowds to take humanity to the next level, the villain of the series manages to pervert this plan by giving the power of the crowds to only the worst people. In the end of the first season, rather than give up on his dream, Rui chooses to give everyone in Japan the power of the Crowds—trusting in the average man to use the power responsibly. The first part of Insight deals with the fallout of this choice. While the Crowds are being used largely for good, a terrorist group with Red Crowds (not created by Rui) begins attacking civilians across Japan—demanding that the use of all Crowds be banned. Rui’s arc in Insight reveals how Rui deals with the widespread rejection of his dream for mankind. Rui believes in the best in people—that while it won’t be easy, individuals are good enough and responsible enough for the world-changing power of the Crowds. Unfortunately, with the terrorist actions, Rui’s support wains; and instead of fighting to become better people, most would rather just return to the days without the Crowds—when they had one less thing to worry about. After all, evolving is hard. Doing nothing is easy. When it comes down to it, the Crowds in Insight are a symbol of the ultimate in individual freedom—power with no obvious responsibility. The leader of the Red Crowds simply believes that humanity is not ready for such unfettered power—and because of that, chaos and danger are sure to follow should the Crowds power continue to exist. The danger that the Crowds represent and the popular rejection of them is directly intertwined with the arcs of the show’s two new main characters: Tsubasa and Gel. Tsubasa is a teenage girl with a strong sense of justice—and is quick to stand up for the weak and helpless. While this is not a bad thing to have in a newly chosen superhero, her childish sense of right and wrong often leaves her frustrated with the world. After all, if everyone claims to want to live peaceful lives, why is there so much conflict? Why doesn’t everyone just live in peace? Gel, on the other hand, is an innocent alien who can see people’s emotional states in the form of thought bubbles—and then consume said bubbles to find out what people really want. Of course, what people generally want is an easy life without conflict, so Gel decides to do everything he can to make a world “where everyone gets along” exist. This also makes Gel and Tsubasa fast friends. Over the course of the series, the two manage to not only get Crowds banned but even get Gel elected to the office of Prime Minister—causing massive reforms in the government and how it supports the common man. Thus, the day a problem arises, people vote on a solution—whether people are properly informed or not. The entire government runs on knee jerk reactions. This is the problem of a true democracy and the reason countries tend to be representative democracies instead—i.e., rather than have the uninformed masses decide every issue, you have them vote for a person they trust to be informed and handle the situation with the voters’ interests at heart. To Gel’s surprise, a sizable portion of the population is not happy with the majority rule. To fix this, he adds a third box to each vote: Let Gel handle it. And as most people feel uninformed or just don’t really care, the vast majority votes to let him handle everything—turning Japan into a dictatorship without anyone even noticing it. It’s then that the Kuu appear. These kind, happy monsters birthed from Gel appear to want nothing more than for everyone to get along. However, they are more than that. The Kuu are the physical manifestation of what the majority feels. So when someone acts as an individual too often and the group feels bothered, the only way for the Kuu to bring back public harmony is to remove the individual—by devouring him or her. In this way, the Kuu are a physical police force ruled by the public unconscious—and the exact opposite of the Crowds (as the physical manifestation of an individual’s personal will). Again, this all comes back to human nature and the “lie” of a peaceful world. Everyone wants peace, sure. They just want to live their lives and not have to deal with troubles or conflicts. However, in a world where everyone agrees, there can be no ideas but the social norm. The Kuu prevent anyone from giving a dissenting opinion—at threat of death. Society is basically holding itself at gunpoint. Should the Kuu continue to exist, humanity will become stagnant—unable to grow or change. They represent the end of human societal evolution. They also all but guarantee peace—a terrible, horrible peace. One of the best facets of Insight is the Gatchaman team itself. They are a single team yet they are vastly different individuals. Jun has dreamed of world peace so he is willing to go along with Gel—until people start getting eaten. Sugane is popular at his university, enjoying the public love of the Gatchaman as heroes. Pai Pai, the team’s leader in name only, has refocused his life toward making a world safe for children—so a peaceful world under Gel sounds great. The others, namely O.D., Rui, and Hajime, remain much more wary of the massive societal changes going on. And while the two groups within the Gatchaman rarely agree on how to act, they never resort to physical violence against one another. While different, they are a team unified in trying to protect the Earth. Once again Hajime is the most interesting character in the anime. While most fiction has a character that develops based on their interactions with the world, it is the world of insight that develops based on its interactions with Hajime. Hajime has an unshakeable view of the world and her place in it. Like anyone she wants to live a peaceful existence. She is willing to go to extraordinary lengths to make everyone she comes into contact with happy—and hopes to inspire others by her example. However, she still realizes that what makes one person happy sometimes actively hurts others—and that these people must be stopped. Even then, however, she tries for the path of least harm—which is why she shares her body with a being of pure evil in Insight. But what’s more interesting than having pure evil inside her is that she remains uncorrupted by it. When Gel uses his powers to see everyone’s emotional states, a bubble appears above people’s heads. Most people’s bubbles are blue or purple for sad and yellow and orange for happy. The bubbles change as a person’s emotions do. Hajime’s, however, is gray and never changes. Hajime is perfectly centered as a person. She knows who she is, what she is, and nothing can shake her resolve. The only other person we see like this is Tsubasa’s grandfather, an old man who lived through World War II. He saw firsthand the problems that can come from just getting caught up in the furor of the public unconsciousness when he lost his brother to the war. Now, he doesn’t care about what the popular opinion is. He, like Hajime, is a true individual—basically the kind of person Rui is hoping to foster with the Crowds. In the climax of the anime, everything comes to a head. Hajime sacrifices herself to calm the rampaging Kuu and wake people up to the inherent problems of both the voting system and going with the flow instead of thinking for themselves. The final fight is brutal and the fallout depressing, but both are well realized. What’s great about it the climax is that it’s not some trick. The other Gatchaman do go all out against Hajime—and she feels every blow and even the loss of an arm. To get the point across to the people, it had to be real. They had to be forced into seeing what it would take to diffuse their misguided bloodlust. And the only way to do that was for the Gatchaman to go way too far in their brutality in the final battle—forcing the common individual to stand up and condemn it even in the face of popular opinion. Yet, even with Hajime in a coma, some of the Kuu still remain—thanks to those who still haven’t understood what Hajime did and are still just going with the flow. And with the return of the Crowds, the battle of individual freedom versus societal will continues even after the final credits roll. In the end, Insight is an excellent anime that uses a superhero setting to explore humanity and the eternal battle between individualism and the will of society. What’s better still is that while it gives no easy answers, it does have a simple message: Don’t just go with the flow. Think. Think hard. Then act according to your personal beliefs and moral code. If that’s in tune with the majority, great. If not, that’s fine, too. And I’ll be damned if that isn’t a principle worth living by. Gatchaman Crowds Insight aired on Nihon Telebi in Japan. It can be viewed for free in the US with English subtitles on Crunchyroll and Hulu.